JOHN RAMSDELL became a member of the Rotary Club of White Plains in 1961 under the sponsorship of Dr. Merton Flaherty. John was involved in various committees and would have been president in 1977, but it was at the same time that he was chosen to serve as president of the Westchester Medical Society. Given the responsibilities of that position, his obligations at work and home, John was not able to accept the presidency of the Rotary Club until his retirement. He served as president in 1995-1996. John’s love for Rotary stems from the Rotary principles and the members. These are what has kept him involved in Rotary all these years. Paul and his wife, Barbara, are Paul Harris Fellows. John has had an extensive and long relationship with the White Plains YMCA and the YMCA of Central and Northern Westchester. 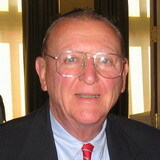 He has served as Board Member and Chairman of the Boards of both organizations. He has participated in many trips to the YMCA in Spanish Town, Jamaica, WI, and travelled with the YMCA to China and Hawaii. He was a delegate to the YMCA of USA General Assembly- Boston and St. Louis World Council of YMCAs at Warwick University, Coventry, England 1994. Prior to John’s retirement in 1992, his appointments included the White Plains Hospital Center and St. Agnes Hospital. He was a consulting surgeon at New York Hospital, Westchester Division and the Burke Rehabilitation Center. He served as Chief of Staff of The White Plains Hospital in 1974-1979; President of the Medical and Dental Staff of the White Plains Hospital, 1970-1972 and President of the Westchester Medical Society of Westchester County, 1977-1978. Additional appointments are: President, American Cancer Society, Westchester Division; President, United Fund of White Plains, 1964-1965; President, Westchester Surgical Society, 1974-1976; President, Westchester County Board of Health, 1984-1989; Chief Medical Officer, Civil Defense, City of White Plains, 1962-1968; Chairman, Medical Advisory Board of Westchester Visiting Nurse Society, 1970-1983; Chairman, Medical Advisory Committee of American Red Cross, Westchester Division, 1965-1975. John received his undergraduate degree in Economics from Yale University, his medical degree from Columbia University College Of Physicians & Surgeons and a Master of Science in Surgery from the University of Minnesota. He is a veteran staff sergeant of the United States Army, Finance Corp, 1945-1947. John and Barbara, who married in 1955, are the parents of Pamela Mitchell, J. Sadler Ramsdell and Peter Ramsdell; and grandparents of seven.